It has been a very mild December for us here in Missouri. We were thankful for the weather that we did have as we laid Tippy to rest in our orchard. Tippy was our dear sweet kitty. She will be missed, and there is quite a void in our house without her. Sox our other cat grieved over Tippy. I didn't realize how much her passing would affect him, but it did, it affected all of us. On the day we buried Tippy, the weather was very mild and we decided to take a little walk around our farm. As we went buy our raised garden beds, I noticed some growth. Some of our onions and spinach are growing. 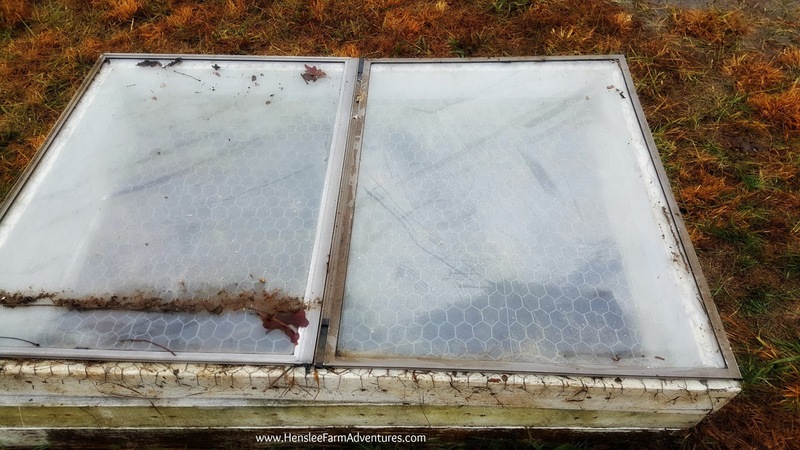 I knew we had some old windows that we were saving to use for a greenhouse, so I asked Steve if he could fashion a cold frame for me. Little onions and spinach growing. I have wanted to try and grow vegetables during the winter months, and I thought this was the perfect time to start my hand at it. I'm not sure if this is going to work, but I will let you know. With the raised beds, all we did was use one of the covers that Steve built, and then put the windows on top to create a greenhouse effect. I will have to keep a close eye on them to make sure that they are getting enough water, and sunlight, but not burning up either. A true cold frame would allow you to raise the glass so that the heat it generates from the sun does not burn the plant up. At this time, we do not have this feature which is why I need to keep a close eye on it. Our windows sitting on top of the cover on our raised garden bed. If you would like to watch the video I have it shared below. It also shows you a beautiful view of our creek. If you would like to see more of our videos, then check-out our YouTube channel. Let me know in the comments below, have you ever gardened with a cold frame?